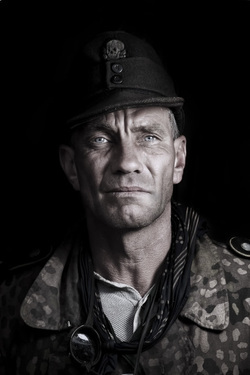 Welcome to the multiple award winning living history group Kampfgruppe Stahlkrieger (KSK). We portray the elite troops of the 1st SS Division. Leibstandarte Adolf Hitler - The LAH. We have a reputation of being one of the best known living history / re-enactment groups in the United Kingdom, with an eye for detail in all aspects of our German portrayal. Our members come from all walks of life and share a united passion in both educating and entertaining the public in one of the darkest eras of the twentieth century. Please look inside our website and feel free to contact us! We must stipulate that we a living history group only, and do not have any political agenda. We do not condone any extremist views or beliefs. Please note this website is optimized for 1600 x 900 resolution.